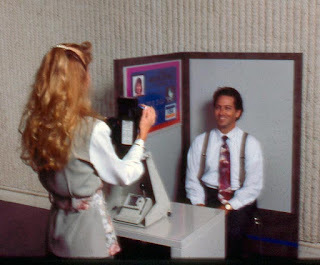 When I worked for Bank One in downtown Phoenix in the '90s, I wore a shirt and tie. I'm sure that the company had some kind of dress code, but I never knew about it. I just knew that if you dressed as if you were going to be playing tennis that day, you would feel very out of place in the marketing department. That's me up there, getting my picture taken for "the One Card". Nowadays, of course, when I see someone wearing a shirt and tie in the Phoenix area, I have to wonder "what are they thinking?" Let's face it, Phoenix is hot. Wearing a dress shirt, buttoned up to the top, with a tie around your neck, is no way to keep cool. And even the lightest suit (I always wore what was called a "tropical blend") is enough to make most guys start sweating just walking from their car to a building in Phoenix. So when I tell people that I went to work wearing a suit for years, I have to explain that I worked in a space ship. I worked at what is now called Chase Tower, at Central and Monroe. I parked my air-conditioned car in the parking garage across the street and walked underground to the tower. Yes, there's an underground tunnel that goes under 1st Street. There was no reason to go outside. Once inside of the tower, I took the elevator to the 31st floor. The building was 75 degrees year-round. That's why I call it a space ship. At the end of the day, I drove home to my air-conditioned house in suburbia. I rarely stopped anywhere, except when the weather was cool. So yeah, it's a good idea to have a dress shirt and tie, maybe a suit, or at least a sports coat to wear on special ocassions. But don't expect to wear it much in Phoenix, nor do people expect you to. I worked as a funeral assistant during one summer. When I started I only had one charcoal wool suit. I had to quickly but invisibly gather up the flowers at the church load them into a van(with no a/c) rush them to the cemetery and arrange them before the procession arrived. The summer heat combined with the humidity from the grass was miserable. Sometimes I thought I might be joining the departed. After the summer I became the lead crematory operator. At least there I didn't have to run.